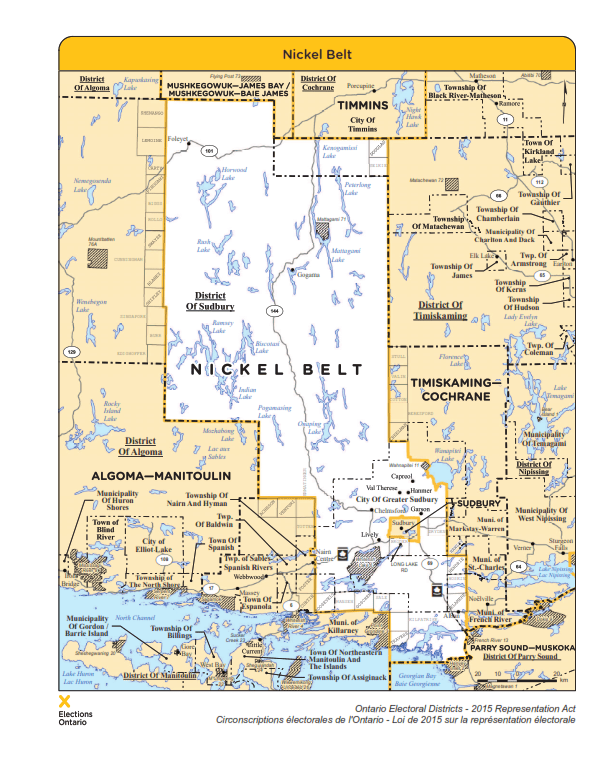 Nickel Belt is a provincial electoral district located in the Canadian province of Ontario. It elects one member to the Legislative Assembly of Ontario. The district is located in Northern Ontario and includes much of the eastern and southern parts of the District of Sudbury, as well as most of Greater Sudbury outside the city’s urban core. Communities include Lively, Onaping, Levack, Dowling, Chelmsford, Naughton, Azilda, Coniston, Wahnapitae, Garson, Val Caron, Val Thérèse, Hanmer and Capreol.